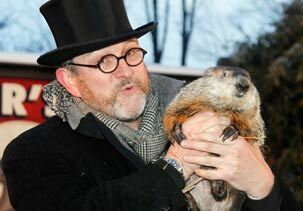 Ground Hog Day 2013—Phil the Ground Hog predicts global warming-no more winters ever!! Phil the Ground Hog predicts global warming-no more winters ever!! But did you know..
Phil the Ground Hog, as we all know, has a little bro, Bobbi, who two years ago was involved in a big riot on Ground Hog’s Day when Phil was coming out (yes he’s gay and single Jody) of his ground hole to predict the weather for 8 weeks. Since then, after the repression of the Da La Lamba (turns out Da La Lamba was actually interested in Phil), things had been quiet until this year. PS—Every winter I get delirious from lack of gardening and write these whimsical stories on Ground Hog’s Day when I really rather be out digging (like a ground hog). Still gotcha? Wanna read more? To read more on Phil the Ground Hog and his little bro Bobbi, go to my previous posts from the beginning of my delirium-The real story of Phil the groundhog! , Phil the groundhog continued.. , Possible Coup Coming on Ground Hog Day in 2011 and Ground Hog Day 2011-Phil Predicts an Early Spring -Fierce Battle Takes Place Before Ceremony . DISCLAIMER: All names have been changed to protect my innocence. 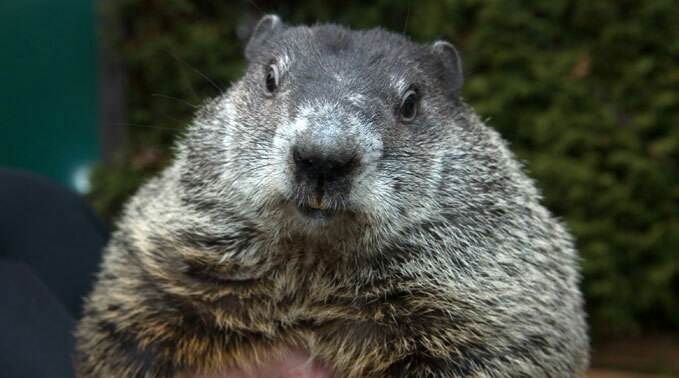 Just in from US national media: Phil the Groundhog from Gobbler’s Knob doesn’t see his shadow predicts an early Spring! Phil the Ground Hog narrowly escapes overthrow! What wasn’t viewed on the US media but was reported by BBC was what really happened just minutes before his prediction. A fierce battle took place before the ceremony. Bobbi and Phil’s handlers got a secret message from Phil of an impending danger for all of Groundhogdom. 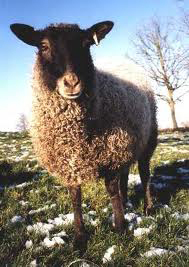 The Daa Lee Lamba, a sheep from the Baaalands of Lakota, (who coveted the groundhog title) and exiled to a Kiddie Petting Farm, intended to overthrow the existing groundhogs and take the title for himself. He and his masses of groundhogs (whom he had converted by hypnotizing them with his stare) had infiltrated the huge crowd of humans who had come to see Phil’s annual prediction. One of Daa Lee Lamba’s groundhog followers, being blind, wasn’t hypnotized and sent a message to Phil warning him. Now the handlers when they heard of this dilemma, didn’t want this to happen as they have a good thing going with this Groundhog Day thing and Bobbi wasn’t going to stand by and let some outsider sheep take over. When the handlers were notified, they noticed a huge group of other groundhogs at the event that were guarding this lamb-the Daa Lee Lamba who had just entered. Upon seeing that, they briskly wisked Phil away for awhile to protect him while Bobbi’s militia entered the event and joined forces with Phil’s troops to battle the Daa Lee Lamba’s troops. When Bobbi stood up and exposed the Daa Lee Lamba’s real intent to all in the crowd, the followers of Daa Lee Lamba’s split into 2 sectors and some started rioting against the Daa Lee Lamba, fighting along with Phil’s and Bobbi’s troops. Many of the humans being alarmed about being in a ground hog riot, fled in fear of being bitten by the ground hogs or shot by Bobbi (who was the only one in the crowd with a gun). The fighting was intense with much biting, kicking and knawing going on between the groups but in the end, the Daa Lee Lamba’s groundhog followers refused to turn against their own kind. Daa Lee Lamba, with tail between his legs, was last seen fleeing the event with only a few loyal followers. The US media reporters, having a blind eye themselves, being controlled by corporate interests, only saw Phil come out and do his prediction. For helping to save Groundhogdom, the handlers promised Bobbi major reform in the Groundhog Parliament and promised to meet Bobbi’s demands of better housing, lower taxes, and Secret Service Protection (for the groundhogs who felt threatened by some humans who thought they were gophers). They also made Phil, King of the Ground Hogs, and henceforward would ask Phil to come out and not force him to come out of his royal home to do the predictions. 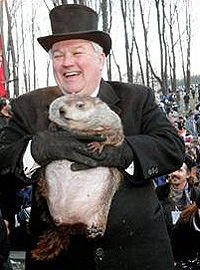 Bobbi became a hero amongst his fellow groundhogs and Phil knighted him, made him Prime Minister and gave him the highest rank of General of all of GroundHogdom to ward off any future intruders. In the end, blood was thicker than water-Bobbi came to the aid of his brother. Thus Groundhogdom and Phil were saved and the future of Ground Hog Day protected… for now. To read the other earlier posts about Bobbi, Phil and Ground Hog Day, scroll down. This will be a special anniversary for Phil the groundhog. Phil has been coming out of his bed for 125 years! The anniversary is called the quasiquicentennial. What he doesn’t know is what is going to happen tomorrow. What an old fart! No wonder Bobbi, Phil’s little brother is sick of him and his seemingly aristocratic ways! What Bobbi, doesn’t know is that Phil’s been forced out of his bed, not voluntarily coming out on his own for all those years and hopes some other groundhog will someday rescue him. The picture you see of him and his so called ‘servants’ are really his handlers who force him out every year. He wants to retire and let some one younger take his spot in the limelight but on Phil’s terms. peace but has secretly coveted Phil’s position for years and has planted other groundhog followers in both Phils troops and Bobbi’s militia organization that keep him informed of what both of them are up to and to stir things up. He has thousands of other groundhogs who look up to him as a holy lamb who will lead them into the night. (they like all things dark and earthy smelling). He also plans on going to Gobblers Knob with his masses of groundhog followers to make sure neither one will gain or retain the title. Phil or Bobbi have no idea of what is to come tomorrow.. Stay tuned for the final conclusion! Just released from Wikileaks: Coming up on Wednesday Feb 2, 2011 is Ground Hog’s Day. Phil, the famous Punxsutawney groundhog will come out of his home (Gobblers Knob) in England and predict whether we will have more winter weather or not. Unbeknown to everyone, Phil has a little brother Bobbi that I discovered and introduced last year on Ground Hog Day. You can read the original post here. Bobbi, Phil’s little brother, is a radical left wing groundhog, one of the original Chicago weathermen group, currently living in Ireland. Bobbi who has long been jealous of his older brother’s notoriety has been planning a coup on Gobbler’s Hill since last year. 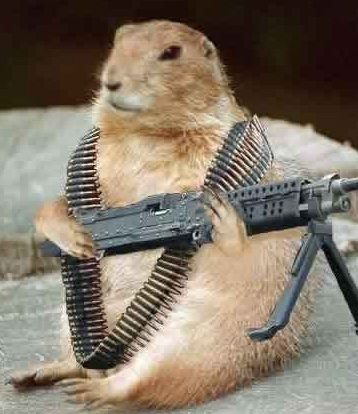 Rumor has it it he has a ground hog militia ready for his takeover of Gobbler’s Hill and exile of his brother Phil from England and plans his attack on Ground Hog Day. Bobbi sees his brother getting fat, old and egotistical with all the attention he gets each year and is sick of it. Some of the changes he wants that have not been addressed in the ground hog world are: mandatory retirement age for Phil the groundhog (Phil’s been in too long), paid admission to see the groundhog every year when he comes out, better food for the groundhogs, better housing, social security benefits, health insurance and secret service protection from those crazy humans who might want to kill them thinking they are gophers. Phil on the other hand, got wind of his brother’s plan and has added extra security for himself and his staff. On Ground Hog’s Day more than just the weather prediction might happen. Stay tuned for the real story.. The real story of Phil the groundhog! 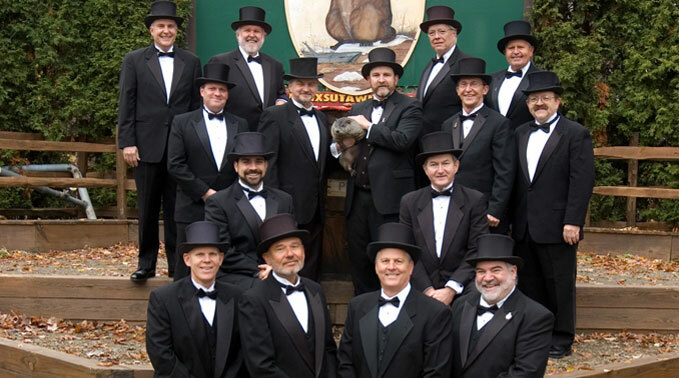 On February 2, 2010 Punxsutawney Phil the groundhog from England, came out of his burrow on Gobbler’s Knob and saw his own shadow and predicted 6 more weeks of winter. Behind Phil’s back, his little brother, Bobbi a radical left wing groundhog, one of the original Chicago weathermen group, currently living in Ireland, forecasted 8 more weeks of winter! Bobbi who has long been jealous of his older brother’s notoriety is currently planning a coup on Gobbler’s Hill. Stay tuned for more updates next year! Yes the snow is back again and I am spending too much time inside and not in the garden! The forecast is for more snow today and on Saturday. Meanwhile I am busy inside planting seeds and transplanting my tomatoes, peppers and eggplants. Starting to run out of space under the lightbox so some will go out by the windows soon. Just read that we are up 137% for water precipitation for the year so far compared to last year. Should be a great spring for wildflowers! Sorry for this but I got to have a little fun while waiting to get in the garden!